Oxford University Press, USA, 9780199793587, 316pp. 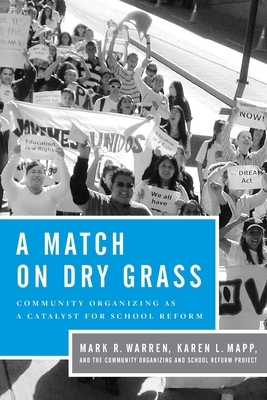 A Match on Dry Grass argues that community organizing represents a fresh approach to address educational failure. Mark R. Warren is Associate Professor at Harvard University, and author of Fire in the Heart and Dry Bones Rattling. Karen L. Mapp is Lecturer in Education at the Harvard Graduate School of Education and author of Beyond the Bake Sale. The Community Organizing and School Reform Project at the Harvard Graduate School of Education, led by Mark R. Warren and Karen L. Mapp, consists of Keith Catone, Roy Cervantes, Connie K. Chung, Cynthia Gordon, Soo Hong, Ann Ishimaru, Paul Kuttner, Meredith Mira, Thomas Nikundiwe, Soojin Oh, Kenneth Russell, Amanda Taylor, Mara Tieken, Anita Wadhwa, and Helen Westmoreland.